Following on from last week I’ve chosen another image generated by tonemapping a single RAW file. 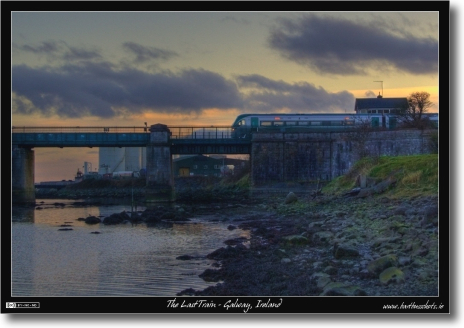 This is an example of a shot that’s not possible with traditional HDR techniques because the train is moving. Normally HDRs are built by combining multiple separate exposures, but since the train is moving, it would appear in a different place in each exposure, resulting in a great big mess! I took this shot while I was in Galway for a few days for a conference. The weather was mostly terrible, and there were very few trains per day, but I managed to find a moment when the weather was good, I was free from conference duties, and there was a train due none-the-less. The sky also really co-operated, putting on a spectacular show. It’s hard to believe I’ve been doing these weekly posts for a year now! I’m so glad this idea worked out, it’s really helped my keep blogging and keep taking photos. 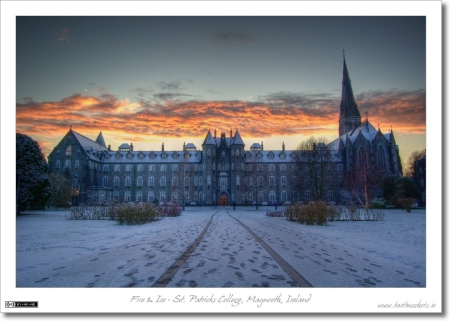 This shot was taken in St. Joseph’s Square on the St. Patrick’s College Campus (AKA NUI Maynooth South Campus) in Maynooth, Ireland. It was taken later the same day as the photo I used for Photo of the Week 50. After it stopped snowing we got a really dramatic sunset over the freshly whitened landscape. It was an amazing sight to behold. The shot was taken from the middle of St. Joseph’s Square looking west towards St. Patrick’s House, and shows two of the campus’s best known landmarks, the President’s Arch (the door between the two towers), and the Gunne Chapel (AKA the College Chapel). Processing: This image was generated from a single RAW file converted to a pseudo-HDR image and then tone-mapped with Photomatix Pro. You can see the un-tone-mapped version here.